April 24, 1916: The Easter Rising begins! Today is April 24, 2013 and it has been 97 years since the Easter Rising began in Dublin Ireland. In a world where asymmetric warfare, insurgency, and terrorism dominate the headlines, the Easter Rising stands out as significant due to the fact that it is one of the last “rebellions” to employ conventional methods of warfare. 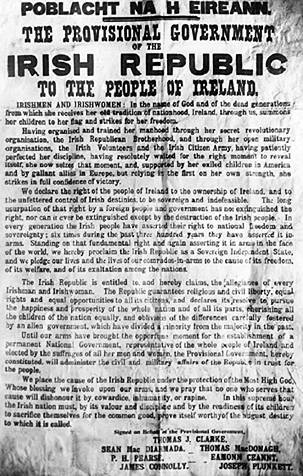 The Easter Rebellion was (generally) the product of Irish Republicans who aimed to establish an Independent Irish Republic. These Irish Republicans carried out their plans of a Rising using conventional methods of warfare that are seldom seen in rebellions today. Such conventional methods employed by the Irish rebels were the fact that most (if not all) of the Irish Republican forces were wearing uniforms and/or visible items that identified themselves as combatants. Further, the Republican forces carried their weapons openly and occupied places such as the General Post Office (in Downtown Dublin) as their headquarters. Finally, most (if not all) of the fighting was between British Military forces and Irish Republican Rebel forces. There are historians who will read this post and quickly point to specific incidents that could be considered LOAC violations. However, I post this information merely to point out that while we have come a long way in 97 years, it was not that long ago when a rebellion, insurgency, etc. was fought in such a conventional manner. This entry was posted in LOAC and tagged Easter Rising, History, Ireland on April 23, 2013 by Travis Normand.